(AP) ATLANTA - An outbreak of infected tattoos has led to an unlikely source: the ink. With the growing popularity of tattoos, health officials say they are seeing more cases of a nasty skin infection caused by a common bacteria traced to the ink. In the largest outbreak, 19 people in Rochester, N.Y., ended up with bubbly rashes on their new tattoos, researchers reported Wednesday. Infections from tattooing are nothing new. 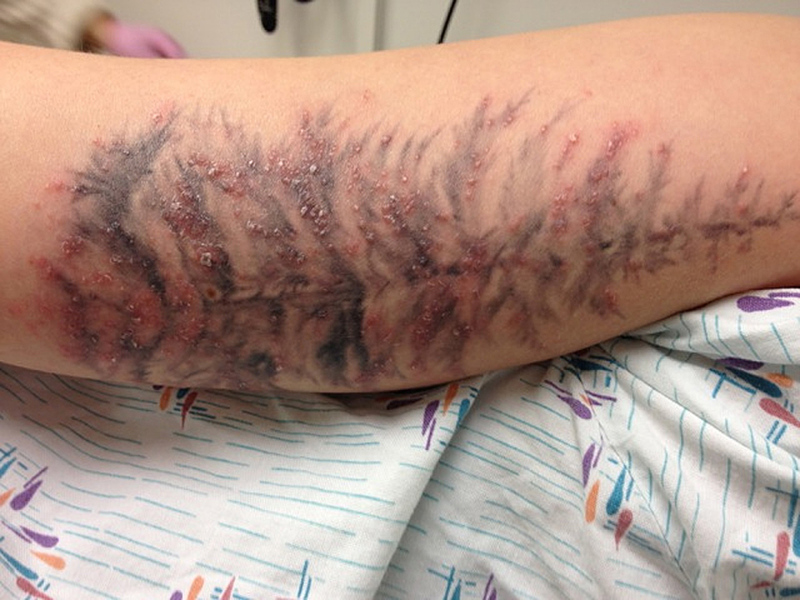 Hepatitis, staph infections and even the superbug known as MRSA have been tied to tattoos. Dirty needles and unsanitary conditions are often to blame. But all the New York cases were linked to an unidentified artist who wore disposable gloves and sterilized his instruments. The problem, investigators concluded, was in the ink. "Even if you get a tattoo from a facility that does everything right, it's not risk free," said Dr. Byron Kennedy, deputy director of the health department in New York's Monroe County. He is lead author of a report on last fall's Rochester cases was released by the New England Journal of Medicine on Wednesday. In the past year, there have been 22 confirmed cases and more than 30 suspected cases of the skin infection in Colorado, Iowa, New York and Washington state, health officials said. The infections were tied to ink or water used to dilute the ink. Tattoo artists and ink makers should use only sterile water to dilute ink, health officials advise. Scattered reports of the illness in tattoo customers have been reported over the past 10 years. But they may be growing more common as more people get tattoos, experts said. An estimated 1 in 5 U.S. adults have at least one tattoo, an increase from years past, according to polls. The illnesses were caused by a bacterial cousin of tuberculosis named Mycobacterium chelonae (pronounced chell-OH-nay). The bacteria can cause itchy and painful pus-filled blisters that can take months to clear up, and involve treatment with harsh antibiotics with unpleasant side effects. The bacteria are common in tap water, and have been seen in the past when tattoo artists used contaminated water to lighten dark ink. The ink used in New York was "gray wash," used for shaded areas of tattoos. The ink was recalled and has not returned to the market. Companies that make gray wash sometimes use distilled water to lighten the ink, thinking it's clean of infection-causing contaminants. But the bacteria can live in that too, said Tara MacCannell, who led a related investigation by the Centers for Disease Control and Prevention. Her study appears in CDC's Morbidity and Mortality Weekly Report released Wednesday. Some ink manufacturers add witch hazel or an alcohol preservative to lower risk of certain viruses, but those additives don't kill off the hardy chelonae bacteria, she added. Investigators found the bacteria in opened and unopened bottles of ink at the New York tattoo parlor. They did not find it in water at the shop, MacCannell said. Health officials say tattoo customers should ask what kind of ink is being used and what measures are in place to prevent infections.